One of the oldest zoos in Europe, this attraction manages to pack a lot of animals into just 7 hectares – 2000 creatures covering about 270 different species. This is to the detriment of the animals for now; however, there are active plans to expand the zoo. Seals, white lions, ponies, lamas, kangaroos and eagles are some of the crowd favorites. In a special section called the Garden of Good Hope, children can ride ponies. In the Baby Zoo section, you’ll find an animal nursery. Check out the wooden Sculptor Gallery too. You’ll fountains and benches a-plenty as you wander about; despite it’s small size, the zoo is quite a pretty place. 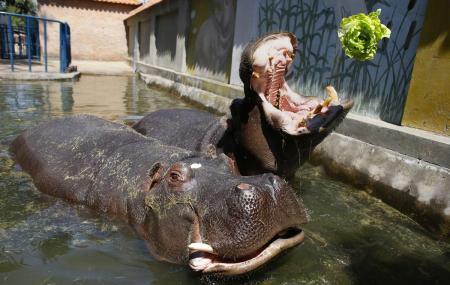 How popular is Belgrade Zoo? People normally club together The Belgrade Fortress and Belgrade Military Museum while planning their visit to Belgrade Zoo. Great as always. I like to spend time with my kids there. You can find different activities inside Zoo. Great place for kids and adults as well. You can also take coffee inside, there is a two bars. They are not cheap, but view is priceless. You will surprise how many different animals you will see. Some of them are very rare! Just before you go, make sure the weather will be good. Well maintained and clear ZOO. Nice place for a walk especially with kids. More likely to wait in a queue for an entrance but it's passed faster. In a good weather is possible to have many people, but this is not a problem. Pretty good zoo. All the animals are there. My only concern is that they keep some animals in huge forest like enclosures with huge glass windows and others in plain cages.